One of the most recognized furniture designers and makers of the 20th century, George Nakashima is celebrated for his traditionally-inspired designs and legendary craftsmanship. Nakashima studied architecture at the University of Washington, Seattle, the Ecole Americaine des Beaux-Arts Fontainebleau in France and at the Massachusetts Institute of Technology. While in an internment camp during World War II, he learned the art of Japanese woodworking from a local elder. He subsequently traveled the world via steamship before finally settling in Japan. Here he worked for Antonin Raymond, an American architect who had collaborated with Frank Lloyd Wright to design the Imperial Hotel. 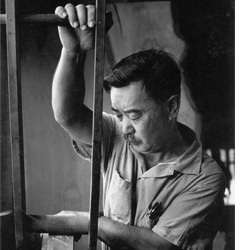 Back in America, Nakashima became a major figure in the American craft movement. His furniture is recognized for its simplicity and for the careful attention to material qualities. He often juxtaposed the natural edge of a piece of wood with traditional Japanese joinery. Nakashima’s Splay Leg Table and Straight Chair designs were created for, and originally produced by, Knoll in the 1940s. Consistent with his body of work, these Knoll pieces combine the modern aesthetic with a deep respect for the natural forms of a tree and the inherent beauty of wood. The pieces were reintroduced by KnollStudio in 2008. During his career, Nakashima received the gold medal for craftsmanship from the American Institute of Architects, the Hazlett Award, and, in 1983, the Order of the Sacred Treasure — an honor bestowed upon him by the Emperor of Japan. The subject of several one-man exhibitions, Nakashima also authored The Soul of a Tree: A Woodworker's Reflections.